Aww shucks, y’all …. thanks! We’re speechless. We’re honored. We’re deeply grateful. The readers of Blue Ridge Outdoors magazine have voted Appalachian Voices as the “Best Environmental Organization” of 2016. 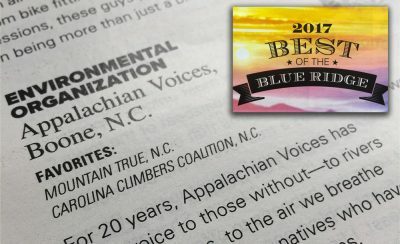 We had stiff competition, to be sure — MountainTrue, champions of resilient forests, clean waters and healthy communities in Western North Carolina, and Carolina Climbers Coalition, which promotes safe climbing practices and preserves access to climbing areas in North Carolina and South Carolina. We wish to thank everyone who voted for Appalachian Voices. It’s a tremendous honor, made even more special as we enter our 20th anniversary year. We are committed to doing our best, doing all we can to continue protecting our beloved Appalachian region in the years ahead. For 20 years, Appalachian Voices has given voice to those without—to rivers and mountains, to the air we breathe and the Appalachian natives who have been ignored for generations. In 2016, the organization worked hard to shed light on the threats our beloved Russell Fork River faces from coal mining, held Duke Energy accountable for the coal ash spills of 2014, and assessed hundreds of abandoned mine lands for potential use as solar facilities or recreational areas.